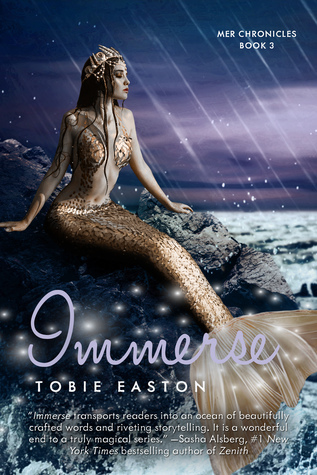 Welcome to the book blitz for IMMERSE, the third book in the young adult fantasy romance series, Mer Chronicles, by Tobie Easton. See below for information on the book and series, buy links, an exclusive excerpt, and details on her giveaway. With threats Below growing more ominous by the day and a powerful ancient ritual looming, soon the two girls can’t escape each other. As their fates grow increasingly intertwined, Melusine might be the only one who can help Lia find the answers she desperately needs to save everyone she loves and to achieve her happily ever after. But can Lia trust her?. I’ve come on the librarian’s day off and have the whole place to myself. I swim up to the highest shelves, where there rests a large, gilded starfish, the symbol of balanced justice. What’s happened to Clay at the hands and fins of Merkind has been anything but just. I’m hoping that means justice is on our side throughout our quest to make him a Merman. I rub the starfish for luck. “Help me find a way,” I murmur into the varellska’s quiet stillness.